Dell does more than just creating eco-friendly products or one-off CSR initiatives. At Dell they incorporate sustainability into everything they do – from design to recycling and every step in between. Through innovation and focus on efficiency, they constantly work on minimizing their footprint while helping customers reduce theirs. One of the steps taken by Dell is, instead of just selling products conventionally, to offer PC’s as a service consisting of Dell’s PC technology, software and lifecycle services including deployment, support and asset recovery services plus exclusive tools that automate, troubleshoot and resolve system issues faster. All of this combined into a predictable payment solution, financed through Dell Financial Services. The customer then pays one single price per month for a contract period. Dell/Dell Financial Services keeps the ownership throughout the entire life cycle and can manage the product through design, usage, maintenance, reuse, re manufacture and recycling. A smarter use of resources is at the heart of the circular model, challenging vendors to find new ways to reuse, re-manufacture and recycle materials. Product as a Service has been identified by the World Economic Forum as one of five primary circular business models which have proved to be successful and scalable. The customer pays for the use of the equipment instead of its ownership and upon its return, equipment is data wiped and disposed securely. Managing asset return for re-use or recycling in a compliant manner is standard practice at Dell. 98% of the assets that are returned to Dell Financial Services are resold, remaining 2% are recycled. 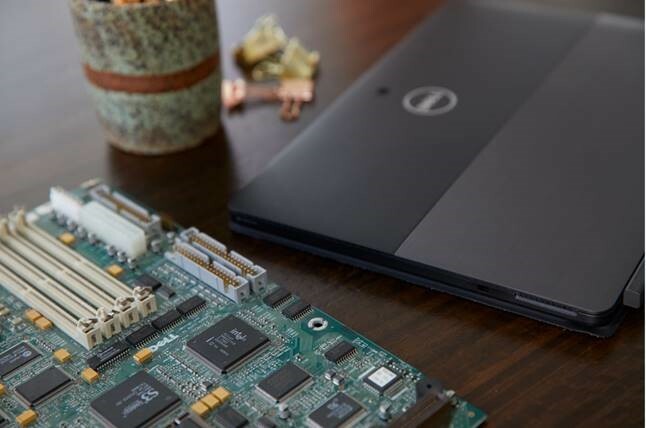 Since 2015, Dell have recycled more than 22 million pounds of plastics from end-of-life electronics back into new Dell products making them an industry leader in the circular approach. The readiness and knowledge for a circular approach varies hugely between organisations and stakeholders, and discussions often take place in silos; IT, Finance, CSR, often causing a preference for the ‘traditional’ buy up front model, although leasing can give better life cycle value in terms of both environment and cost for the customer. Strong bias towards ownership. Leasing is different from a contractual point of view compared to a purchase and it can be difficult to benchmark total cost of ownership vs total cost of usage. Dell believes that the future requires a real change in mindset around creating value, and that it will take new types of collaborations that disrupt traditional operating models. Most organisations do not yet return old equipment to the vendor, so huge opportunity to drive up return rates of used equipment. Today’s IT challenges are helping to change the corporate mindset – the transition to the so-called third platform, the move to cloud computing, to ‘as a service’. This happens in mini-steps, rather than giant leaps. And leasing, rather than buying, is the perfect vehicle for that transition.